Update: Now working for Strava, Garmin Connect, Ride With GPS and Bike Route Toaster! For a while now you have been able to view 3D elevation profiles for any segment on my Segment Details page (e.g. Alpe d’Huez). Clicking on the 3D tab shows you a colourful graphic depicting the segment in all its glory. Not only that but you can click (or touch) and spin the thing round and tilt it to find the best view. 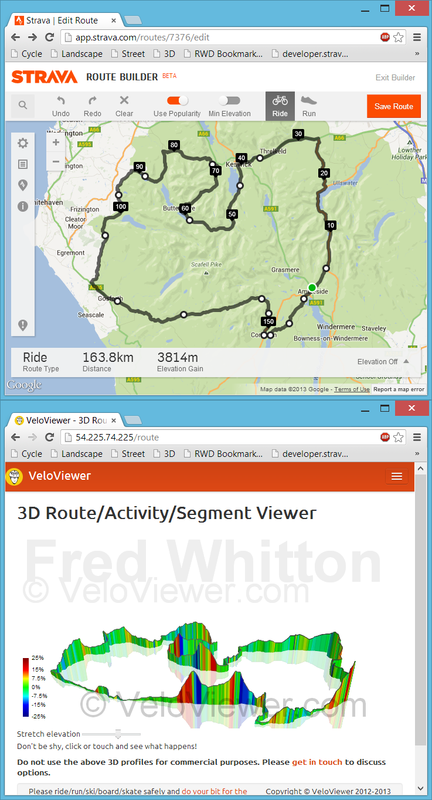 Just visit the 3D Route/Activity Viewer page and follow the instructions. It has been simplified since the first incarnation in that you no longer need to allow for popups. Also more detailed, browser specific instructions are given to walk you through setting up your bookmark. Once you’ve got that bookmark set up it is as simple as navigating to the Strava, Garmin Connect, Ride With GPS or Bike Route Toaster page of your choice and clicking your bookmark. The code also works on iPhone and iPads now although the process of setting up your bookmark is a little more involved (once again, full instructions are given). 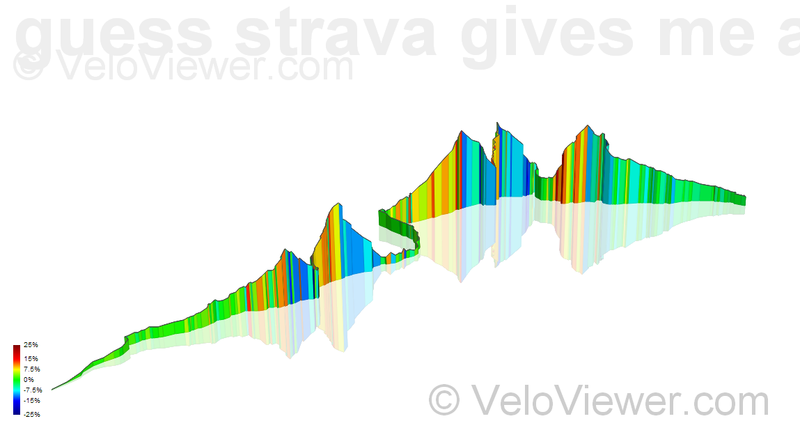 If you are viewing a segment on Strava (segment details page, not a activity’s segment effort) then the same bookmark will navigate you to the VeloViewer segment details page where you can view the 3D view along with all the other details. By default the 3D view will always start off being viewed from the South (at least it should!) no matter what the direction of travel is. Whenever I create a image of a profile I’ll always spin it round until it looks its best which could be from any direction really. I’ll add a little arrow to one corner of the grid to show which way is North to take the guesswork out of it. Have you considered placing map tile on the xy plane? Not sure if there would be scaling/alignment issues, but would be interesting to see the map underneath and the elevation in 3D. I have and it nearly melted my brain trying to get it to work. You can’t add perspective to images in the same control as the 3D view so I was trying to underlay the 3D view with a CSS perspectived map image and it was impossible to get it to line up given that everything is dynamic in size. Couldn’t you use the tiles as textures on rectangles like you do the grid in the 3D view? From what I’ve read you can’t apply perspective or distort images in SVG. The Grid is just lots of Paths, although you can use images to fill a path you can’t apply the perspective so it would only work if viewed directly from above. More than happy to be told otherwise if you can work up a jfFiddle showing how it could be done. Oh I see what you mean. That’s unfortunate. Guess that’s where WebGL might’ve been an advantage… am amazed at how far SVG support has come. Not on purpose! I’ll have a look into it. I’ve added an update above to explain the current situation with this feature.